This May 1st I took a step into a new decade, probably my last one. On the above date I reached the BIG 80! So, its only natural to assume that this will be my last one; as I read the obituaries from my home town of El Paso, I note that most of the deaths are below that age, or slightly above. Don’t get me wrong, I am in good health; but my life has been lived, and I am ready to go when the Good Lord calls me home to be with him and my beloved. I hope that when I reach the pearly gates the book that records my life will be filled with pluses; I have certainly always strived for that goal. 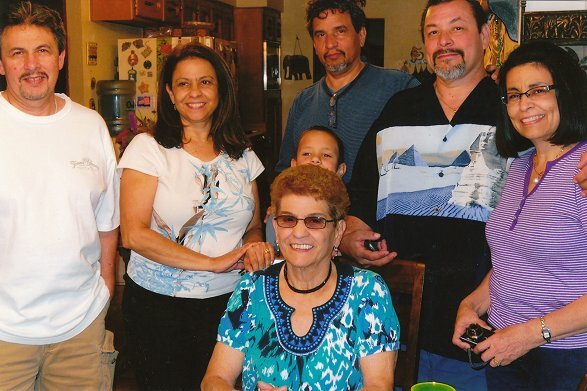 The last two weeks were full for me, I motored to El Paso to spend Easter with my son and family; then returned home for a few days to get ready for my birthday and Mother’s Day which would be celebrated in my hometown. The children wanted to throw a gala celebration for the big 80, but as I told them, I was not ready for that; I preferred a low key weekend with my children, which we achieved. First on our agenda was a visit to their dad’s grave at Ft. Bliss National Cemetary. This is always a sad occasion, but we did manage to laugh, thinking of things he said and did. We played scrabble, poker, talked, laughed, cried, and generally had a very good time. Of course, we had lunch at Chico’s Tacos, their visit would not be complete without it. They all left on Sunday, and I decided to stay until I was to fly to Dallas for Mother’s Day. That weekend was also fun; I was able to see my daughter’s new houses, which are a block from each other in McKinney, a beautiful, serene place to live. I met my grandson’s girl friend, spent time with my granddaughter and her husband, and all the assorted family members. We had decided to have a baby shower for my granddaughter on that weekend, since everyone would be in town, except for my son who lives in Ruidoso, but he was there in spirit. CAN YOU IMAGINE ME, A GREAT GRANDMOTHER? Well, all I had to say was Hooray! The little girl that I used to carry would be carrying a baby girl of her own, due to arrive July 15. We are all so excited. On the following Monday, I flew back, drove to Ruidoso, and faced reality. There is always that feeling of happiness and dread that tugs at me on the way home. I am happy to get back, and also sad to enter that empty house again. There is a scurrying of activity, un- packing, washing, opening mail, paying bills, etc. that occupied most of my day, then the coming days loom ahead; sending resumes, actively looking for a job, and looking for things to fill the void. I began to clean the yard; and not thinking, allowed my pooch Chico out to what I considered a dog proof yard. I got busy in the front, feeling confident that he could not get out. When I looked around, there he was in the street. He managed to find a way to sneak out while I was busy; the only way to get him back was to get in the car and start moving. He got to the driveway of my neighbors across the street, so I drove up and opened the door. He climbed in and I started backing out, thinking the way was clear. When I heard a thunk, I thought it was only a rock and kept on going, but the car stopped. I got out and saw that I had run over a railroad tie, and it was not allowing me to move. As my hubby used to say “How did I manage to do that?” My excuse is that their driveway is on an incline, and I did not have a clear view. I called my superman son, who came to the rescue. It doesn’t look like the car sustained any damage, thank the Lord. He drove it around for awhile, and said it seemed O. K. and told me I was very, very lucky. The Good Lord watches over me, what else can I say? Stayed tuned for the next episode of the Perils of Alicia. Does it sound like I am getting a little tired of this weather? WELL, I AM!!! 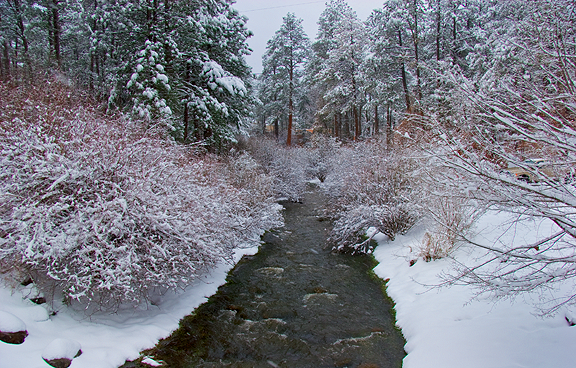 Cool, beautiful, friendly, serene Ruidoso has always had snow and cold in the wintertime. We are used to it. But in the sixteen years that I have lived here, I do not remember ever having below freezing temperatures for a week and a half. Combine this with one of the largest snowfalls to come our way in several years, and you have DISASTER. This same storm hit over 20 other states, most with much more severity. I know my hometown of El Paso, Texas also suffered from snow and cold, and they hardly ever get both! At least the majority of Ruidosoans know how to drive in this weather, with one big exception, me. The snow readily turned into ice, making travel extremely dangerous. The good side is that I have a friend who volunteered to pick me up in her four wheel drive truck, and I readily accepted; thanks Kelly. I do not have a vehicle equipped with four wheel drive because my hubby never wanted one. He could drive in any weather, and I depended on him. I can get down our little hill, but getting back up is quite another thing. The snow plow angels came on the third day, and hit my street. My two wonderful neighbor gals across from me came over with shovels and got that darn snow out from in front of my car and cleared a path to the street. Isn’t it wonderful to have friends like that? Because of the low temperatures, pipes across town froze, and then burst. We were swamped at work (my job is with a plumbing firm), everyone wanted our services at once, if not yesterday. The Village of Ruidoso has started to take some action, shutting the water off several sections at a time, checking for some of the huge leaks which had begun to deplete our water supply. We are a resort town, and a large majority of the houses are vacation homes, empty at this time. So any leaks would not be known or reported. Everyone in town has been most considerate, understanding the situation and putting up with the inconvenience. We’re just waiting for the wave of vacation home owners to hit town; not all of them are patient. I had gotten used to getting up in the morning and seeing the low temperatures. This morning I was quite surprised to see that it was 30 degrees; we’re having a heat wave! Today the high was in the 50’s, and I’m praying that will hold through next week end. All my children are coming in for their Dad’s second anniversary mass, and I know most of my family will attend. It will help me considerably being surrounded by them, I still get quite emotional; the sense of loss is always present. Happy Valentine’s Day to all lovers, young and old; I had a love of my own. The name says it all–I don’t know what to call my writings for today, except that. It started as an ordinary day, being awaken by my faithful alarm clock (my pooch Chico) at 5:30 A. M. Why go back to bed? I turned on my computer and started by reading all my e mails, none too important, people trying to sell me things I don’t need or want. Those that I do answer are all my faithful Publisher’s Clearing House notes which promise to make me a millionaire. Why not? Somebody has to win, it might as well be me. Then I check my bank, want to make sure of what I’ve got, then I go to the fun stuff==Facebook! Here is where I get to read all the postings of those who are my friends on this wonderful website. I see their pictures, read their comments, laugh at some and pout at others. I don’t write anything, except maybe a comment or two on my families postings. Who would know that someday I would be able to keep up with everyone’s doings, whether they wanted me to or not. Hey, put it on Facebook and the world knows about it. I went to the casino and had some good luck; the penny slots were good to me. Several hours pass and I forget everything except what’s going on in their digital brains. One game in particular gets my fancy; they are all rock and roll insects who play the guitar, and when you hit the bonus, they all play their hearts away while giving you money. What a good past time if you don’t overdo it, because sometimes they refuse to come out and play. I got home and had some sad news , an old friend passed away. By old, I don’t mean by age, but by years of knowing him. He was somewhat instrumental in getting my hubby and me together. He was a friend to both of us, and eventually we met through his sisters. We were close at one time, as young married couples tend to be; then our children started to arrive and pulled us in different directions. We met here and there and compared notes, but time slipped away and before we knew it, the Good Lord called them both home; I am sure they will meet again , and be pals as they once were. As Sophocles said “Now let the weeping cease, let no one mourn again, these things are in the hands of God”. It’s easy to say, but so hard to do. Next month will mark the second anniversary of my love’s passing, and I know he is in God’s hands, but I am here by myself, coping as best I can. Each day is a new beginning, and passes quite quickly. I don’t know where my life is heading, but I want to be fully aware of it when it does. Assure your families that they are loved, over and over again. The beginning of a new life! Nothing else at this time could have possibly been any better for me. I witnessed the wedding of my only granddaughter on May 29 of this year, wearing my wedding dress, which her mother also wore . Is there possibly any greater event than that? It sent my spirits soaring, viewing the world with a new perception; I was really refreshed, renewed, and rejuvenated. The majority of my family ventured to New York, and we had a wonderful time. Before the ceremony and festivities, we toured Central Park on a pedicab ( a rickshaw powered by a bicycle and powerful legs), saw a Broadway show, piled through the crowds at Time Square, endured a human traffic jam, and saw all sorts of odd characters. I even had my picture taken with a character I had never heard of, the Naked Cowboy! My children had heard of him as he has been well publicized. He was wearing Jockey shorts, cowboy hat and boots, and a guitar. I can hardly wait to have it printed to send to all my friends. I also had a pic with Spongebob Square Pants, that one will go to my youngest grandson, the older ones being over 19 and would probably not be interested. We met with members of the bridegroom’s family at the rehearsal dinner, and they all were extremely nice and friendly. I commented to them that this would be a WOW, Italian and Mexican families merging, and they agreed. The ceremony was held at St. Augustine Roman Catholic Church in Brooklyn, a beautiful church resembling the great cathedrals of Europe. 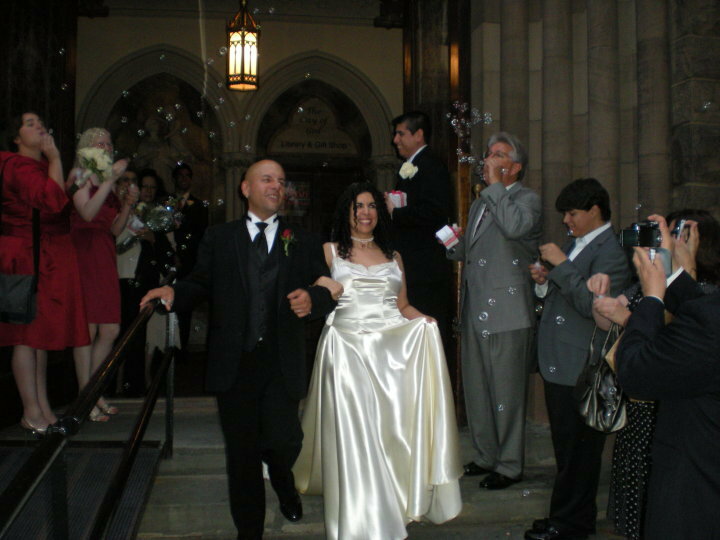 I was escorted down the aisle by my grandson Chris, and I must say we made a pretty picture. My daughter and son-in-law escorted the bride down the aisle, and I have to say , the tears started. I couldn’t help it, wishing with all my heart that my hubby could have been there. My granddaughter assured me that he was looking down from heaven and smiling broadly. We had a grand time at the reception, and I cajoled, begged, and pleaded for my sons or grandsons to dance with me. I must say, they did not inherit our dancing genes, but they did try. I even did the twist with my son-in-law. We returned to Dallas the next day, weary and worn out. The crowds and traffic do get to you, and not to mention the crazy taxi drivers. We only used the subway once, but even that was an experience. To my granddaughter and new grandson, all the love in the world. You have the world in your hands, and the Lord has you in his. Almost the entire world believes that the New Year starts on January 1. I believed it too until I realized that my world was not in sync with everyone else’s. 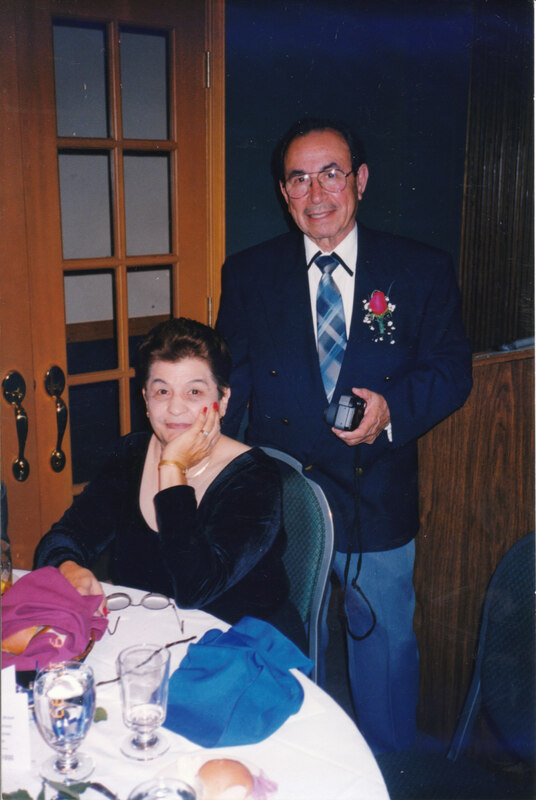 My world, as I saw it then, ended on February 20, 2009, the date of my husband’s passing. I could not see past that date to any future. After 59 years of marriage losing your life partner was just too much to digest. How could I possibly live without him? As I have stated before, my faith and my children sustained me through the hardest days of my life, and continue to do so to this day. I did live, and continue to do so, without him by my side. I speak to him everyday, as I did when he was alive, telling him of my problems, what I accomplished that day, and things that I put aside. It comforts me, and I believe that he hears me. Our children all came to Ruidoso to attend the first anniversary mass of his death at our place of worship, St Joseph’s Mescalero Apache Mission in Mescalero, New Mexico. How he loved that church and its community; when we first attended mass there he told me he felt like he was finally home. Being there has also helped me to cope, and I believe the congregation has been a large part of it. My heart was filled with gratitude and pride when I saw all our family there, not only our children, but sisters, nieces, and brothers-in-law, who drove from El Paso to attend. My cup runneth over. After the mass everyone congregated at the church hall, and I had so many people come and speak to me about him. He used to sing in the choir, and Father Paul, our pastor, commented on the fact that he missed seeing his smiling face every Sunday. It was a very personalized service, and I will always to grateful for that. My New Year started that day; I will go forward to the future, praying for the best; keeping his memory alive in my heart, because he was, after all, the love of my live. There’s a wonderful world out there. I had forgotten about it since the death of my husband five months ago. My world was wound around the pain of losing him, the loneliness of being without him, the confusion of being alone. Some of the above has dissipated, but I cannot say that all of it is gone; I have been slowly reawakening to the world around me. Yes, even the closest people to me have already gone back to their lives, and I realize that I must at least begin to do the same. I came back home after two weeks of traveling between children’s homes, and even visited Florida, to a house of a friend, who is an extended family member. She too, is a widow, and gave me many insights in to our mutual situations. Unlike me, she has been widowed for five years, and has formed a new life in a new community. I hope eventually, I will be able to do the same. While there, my daughter, son-in-law, and I walked the beach every morning. It took me longer because I stopped to talk to people, which has always been my nature. I compared my pooch, back in El Paso with my son, to the pets they were walking, and I spoke doggie talk to them. I stopped and conversed with parents and their children, admired their sand castles, and was amazed at one family who constructed a huge sea turtle. The next day, the tide had eaten half of it. I collected sea shells. Speaking with a lot of single women, I found out that the majority of them were also widows, and we commiserated with each other. There is a group out there that, through mutual grief, is bound together. Back home again, I threw myself into the yard work which I had neglected. The lawn and garden was a shared joy with my beloved, and I found solace in getting it into shape. I started attending meetings with my Democratic party, and I was welcomed with open arms. I began walking with my constant four legged companion. Slowly but surely, the world around me is coming into focus. The mountains are gloriously green, with the daily temperature in the 70’s and 80s’, and the nights nice and cool. My husband’s pet name for our haven was “Cool Pines”. Yes, there is a wonderful world out there. I hope to discover more of it soon. The natural disasters which have taken place, earthquakes, floods, hurricanes, etc. have all claimed lives. Yet more lives are lost worldwide by man’s inhumanity to man. Have we not learned the lessons taught us by history? Are we again on the road to mankind’s destruction? Armageddon, the battlefield described in the Bible in Revelation, as the scene of the predicted final struggle between good and evil, seems to be inching its way into society. The Four Horsemen of the Apocalypse, war, civil strife, hunger and death, seem to be riding full gallop at our world. Is there a defense against all this? In my opinion, the defense must begin in our own homes. We must teach our children to respect their bodies, their homes, their schools, and their world. To respect their bodies, they must treat them as temples of good, forsaking the drugs which bring instant gratification, but turn quickly into life-long dependency. We have recently seen examples of this where several young actresses and performers have wound up in jail. To respect their homes, they must first obey their parents and follow the guidelines set for them. Their home is a place of refuge, from which the world’s ills can best be avoided. Granted, parents are not perfect, but the great majority want what is best for their children. The youngsters, on the other hand, are unformed beings who learn by example. The parents have the task of being the first and foremost teachers to their offspring. If the base is solid, it will hold against all temptations thrown at them by the world. We are brothers and sisters in humanity, placed here to protect and save our environment for future generations. What reward can there be in traveling to the moon and distant planets, if we cannot cross the street to help a human being in distress? Today’s young ones are the leaders of tomorrow, perhaps residing in our own home. They should be learning compassion and caring; the future captains of industry must temper their achievements with deeds of charity. Money can buy a multitude of “things”, but seldom buys happiness. We adults must take a good hard look at ourselves. We did not individually cause the havoc being wrought, but we can unite to fight and correct it. Let’s join hands and start that fight; how about it?